For thousands of years, soldiers have used camouflage to escape detection and hide from their enemies. 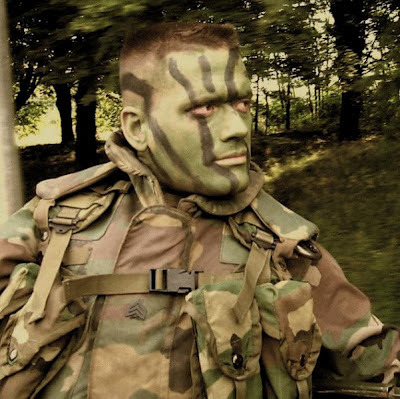 Camouflage face paint has been an iconic look for soldiers the world over. Face paint or camo paint generally utilizes three basic colors, green, brown and black. But depending on the environment, other colors are better. For forests, the best camo colors to use are green, black, and brown. Tan, brown and light green are better for desserts and in snow, grey, green and white works well. For city and urban landscapes, brown, black and grey are usually preferred. Camouflage face makeup for warfare is undergoing one of the most fundamental changes in thousands of years, as scientists today described a new face paint that both hides soldiers from the enemy and shields their faces from the searing heat of bomb blasts. Firefighters also could benefit from the new heat-resistant makeup, according to the report. It was part of a broader symposium on innovations in ingredients for personal care products held during the 244th National Meeting & Exposition of the American Chemical Society, the world's largest scientific society. The meeting, which includes almost 8,600 reports on new discoveries in science and other topics, continues through Thursday. The other reports (abstracts appear below) included new hairsprays, mousses, denture adhesives, tartar-control toothpastes, mouthwashes and personal cleansing products. Robert Lochhead, Ph.D., who presented the report, explained that soldiers have used face paint for centuries for one kind of protection ― to help their skin blend in with the natural environment and shield them from enemies. The new material continues that tradition, but also provides protection from the searing heat of roadside bomb blasts and other explosions that have claimed a terrible toll in Iraq, Afghanistan and other conflicts. "The detonation of a roadside bomb or any other powerful explosive produces two dangerous blasts," Lochhead said. "First comes a blast wave of high pressure that spreads out at supersonic speeds and can cause devastating internal injuries. A thermal blast follows almost instantaneously. It is a wave of heat that exceeds 1,112 degrees Fahrenheit. That's as hot as a burning cigarette. The thermal blast lasts only two seconds, but it can literally cook the face, hands and other exposed skin." In an effort to protect soldiers from this threat, the U.S. Department of Defense has been seeking a solution that Lochhead initially regarded as an impossibility: A material that soldiers could smear on their faces like suntan lotion, leaving a coating that although thinner than a sheet of paper, could protect against that intense heat. Dr. Paige Buchanan, Kelli Booth, Michelle McClusky, Laura Anderson and Lochhead were the team that tackled the challenge. Not only did they succeed, but they discovered a formulation that protects in laboratory experiments way beyond the 2-second heat-wave threat from improvised explosive devices and other bombs. The new camouflage makeup protects the face and hands for up to 15 seconds before its own temperature rises to the point where a first-degree burn, which is a mild burn, might occur. In some tests, the new face paint can protect for up to 60 seconds, which could be important in giving soldiers time to move away from blast-related fires and also for use by civilian firefighters. The makeup had to meet several key criteria: It had to reflect intense heat; have camouflage colors suitable for day and night use; be easy to apply and remove; be waterproof; and be non-irritating to the eyes, nose and mouth. The trickiest part was that the University of Southern Mississippi team had to avoid the use of mineral oil, mineral spirits, fatty substances and other traditional hydrocarbon makeup ingredients. Hydrocarbons can burn in contact with intense heat in the flame spectrum. The team turned to silicones, which are not as flammable because they absorb radiation at wavelengths outside of the intense heat spectrum. Silicones have been replacing hydrocarbons in many commercial cosmetic makeup products as cosmetics companies improve products to confer better feel properties and transfer-resistance. Another challenge was adding DEET, an insect repellent. The military mandates that all camouflage makeups contain 35 percent DEET. "DEET also is flammable, so when the Department of Defense asked us to incorporate it, we didn't think we could do it," Lochhead noted. But the team successfully included DEET by encapsulating it in a hydrogel substance, a water-rich material that prevented DEET from catching fire. It already has passed the preliminary laboratory tests needed to determine whether development should continue. Lochhead's team also plans tests of the material on other surfaces to try to protect clothing, tents and other items from burning, and a colorless version is being developed for firefighters.